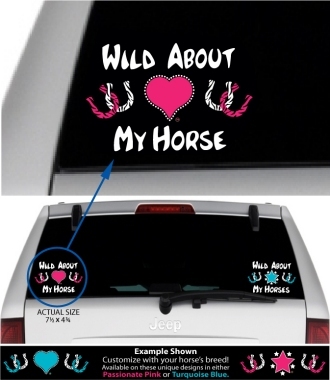 Home > Window Decals > Wild About > "Wild About" window Decals. Available in 32 horse breeds, plus many other names/phrases for girls and guys. Displaying one of our full color custom window decals on your car window is the perfect way to express the love you feel for your Furry Kid(s)! Our one-of-a-kind custom decals are very durable, safe, and easy to apply. Can be used on cars, boats, school lockers, or any smooth surface. Order yours today…you’ll be glad you did! Available in Passionate Pink and Turquoise Blue. So, show off a bit of your wild side and order yours today! Available in 32 horse breeds, plus many other popular name/phrase combinations. Click here to view all of our popular name/phrase combinations. Or...make your vehicle really stand out when you have us add your pet(s) name. Additional charges apply for custom names. Custom names have a 12 character limit(including spaces). 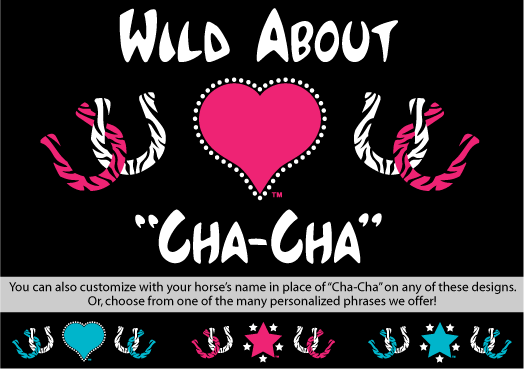 Text: Wild About "custom name" Wild About ... (s) Wild About My ... Wild About My ... (s) Wild About My Grandhorse Wild About My Grandhorses Rescue "Mom" Foster "Mom" (Your Breed) "Grandma" (Your Breed) "Grandpa" (Your Breed) "Auntie" (Your Breed) "Mom" (Your Breed) "Dad"